Q - 5 Stars - Indispensable Spin - Ranked #4 on Spin's list of the "Top 10 Reissues." - "A defiantly timeless soundtrack to the ultimate period picture..." Mojo - "One of the few essential blaxploitation soundtracks...more renowned for its Curtis Mayfield score than its on-screen content..." Rolling Stone - 4 stars out of 5 - "...this is the seminal blaxploitation soundtrack....And it's history." Rolling Stone - Ranked #69 in Rolling Stone's "500 Greatest Albums Of All Time" - "...An astonishing album, marrying lush string parts to funky bass grooves and lots of wah-wah guitar..." Vibe - Included in Vibe's 100 Essential Albums of the 20th Century Rolling Stone - 4 stars out of 5 - "...this is the seminal blaxploitation soundtrack....And it's history." Mojo - "One of the few essential blaxploitation soundtracks...more renowned for its Curtis Mayfield score than its on-screen content..." Entertainment Weekly - Ranked #6 in EW's "100 Best Movie Soundtracks" - "...A testament to the powers of a musician at the top of his game..." Q - 5 Stars - Indispensable Mojo - Included in Mojo's "100 Coolest Movie Soundtracks". Spin - "This definitive blaxplotiation-flick soundtrack spiked his do-right nature with just the right amount of baaaaddness." Pitchfork - "SUPER FLY perfectly encapsulates the post-Civil Rights/early Black Power feel of black America struggling to survive the social and political consequences of the nation's conservative backlash." 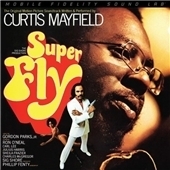 SUPERFLY: DELUXE 25TH ANNIVERSARY EDITION contains 2 bonus tracks and the second disc contains rare and previously unreleased tracks as well as an interview with Curtis Mayfield. Personnel includes: Curtis Mayfield (vocals, guitar); Johnny Pate (arranger, conductor). Recorded at RCA Studios, Chicago, Illinois and Bell Sound Studios, New York, New York. Includes liner notes by A. Scott Galloway.